Don’s approach to music is a weird, unique blend. If he just played folk music, it would be a handy label. But he has invented his own genre with a mix of humor and powerful songwriting. White’s arc as a writer and performer has taken him from his industrial hometown of Lynn, Ma across the country as hitchhiker, through Boston’s comedy clubs and coffeehouses, and onto the stage with greats like Christine Lavin, Arlo Guthrie, Taj Mahal, Ritchie Havens, Patty Larkin, Bill Morrissey, Tom Rush, and Louden Wainright III. At every point, White has been the ultimate observer, infusing his work with his experiences as a husband, a father, a seeker, and a joker. White guesses he wrote his first songs sometime when he was eight years old, tunes he could hum or sing in his head. “I remember writing songs when I was a little, little kid,” he says, “kneeling down to say my prayers and then jumping in bed and showing my mom a song I wrote. I was born with the disease.” As a teenager, he would skip school to write. He took journalism courses. 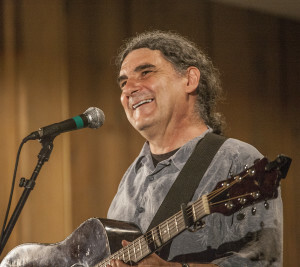 Things started to click when his parents bought him his first guitar at age 15, when White was absorbing music from John Prine, Arlo Guthrie, the Grateful Dead, Frank Zappa, and Bob Dylan. He became a student of music. After impressing Catch’s booker with his wit and storytelling abilities, White began to emcee comedy shows. Just as he had studied music as a teenager, White began to study comedy, watching some of the best comedians on the planet – Janeane Garofalo, Jimmy Tingle, David Cross, Wendy Liebman. White applied those skills to his first studio recording, Two Vagabonds in Disguise, in 1992. The album featured one of his most touching songs, “I Know What Love Is,” which captures beauty of love and loss over the course of its subject’s entire lifetime. That is sandwiched in between two other Don White staples – “Project Girl” and “The Shameful Ballad of Lijah.” Both songs are lighthearted, both drawn from real life experience. That was also the year White released Live at the Somerville Theatre, a collection that produced his ode to his home town, “I’m From Lynn, What Can I Say?” and “Charley & Maureen,” a story that proves that sometimes settling in matter of love isn’t half bad. White followed that up in 1996 with Rascal, adding “Heartbeat of Heaven,” “Great Day,” and the title track to an already strong catalogue of songs that would remain popular in his live sets decades later. White really hit his stride at the turn of the millennium, releasing Brown Eyes Shine in 1999, a collection that has come to be known as “the teenager album” for all of its material about dealing with adolescents. “Stupid” shows grandparents laughing at their kids as they have kids of their own. “The MTV Love Song” is the ultimate combination of White’s ability to make you laugh and tug at your heartstrings in a story of the struggle of different generations to understand each other. His storytelling is in fine form on “Adolescent Rant,” and his epic story of redemption, “Angel In Pieces,” closes out the album. In 2001, White released Little Niche, which included the story “Testosterman in Estroland” and “Not Scared Anymore,” a song about learning to become someone your family can depend on. In 2002, White headed to the Lafayette Grand Ballroom in Pontiac, Michigan, a region that has become White’s second home, to record his Live in Michigan album. A couple of old favorites turned up on that one in “Great Day” and “Sense of Humor,” as well as “Be Sixteen with Me,” a song about turning the tables on your kids that would eventually be covered by Catie Curtis. In 2008, White released a compilation, The Best of Don White 1992-2008, and followed that up with a live album with his old friend and touring partner, Christine Lavin, called Live at the Ark: The Father’s Day Concert. He would finally get back to the studio after a seven-year absence to release Winning Streak in 2011. The album contains eight new original songs, a couple of songs by White’s talented friends, and two live comedy pieces. “Water Wheel” was written by Randall Kromm, and “Good Morning Beautiful” by one of White’s music students, prodigy Hayley Reardon, who wrote it when she was 12 years old. On Winning Streak, White found a comfortable confidence born of being able to work with exactly who he wanted to work with, including friends Christina Thompson Lively (vocals), Matt Leavenworth (fiddle), Michael Cahill (drums), Kristen Miller (cello), Paul Alhstrand (saxophone), and his son, Lawren White (guitar). In November of 2013, Don White headed to one of his favorite venues, the Amazing Things Arts Center in Framingham, with a bunch of cameras and an ace backing band to record two nights of comic storytelling and music. The result is Once More With Feeling, his new DVD. It’s the best showcase yet for White’s musical and comic talents, with a bevy of talented musical friends. This is the biggest production White has put together, directed by Mark Steele (“Nova,” “Frontline”) and featuring a backing band with Seth Connelly, Jackie Damsky, Brian Maes, Christina Thompson Lively, and Tim Moynihan, and jazz vocal band Vox One, which sang on the original recording of White’s classic “I Know What Love Is” twenty years ago. The centerpiece is a set in which White puts down his guitar and gets back to his roots as a comedian and storyteller.